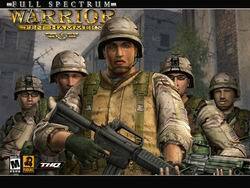 Full Spectrum Warrior: Ten Hammers is the sequel to Full Spectrum Warrior. The games is a real time tactical squad based infantry combat war games from Pandemic Studios. Ten Hammers can be played in single player mode or multiplayer cooperation mode, and it’s available on Xbox, PlayStation 2 (PS2) and Windows platform. Club Skill (dead link) reviews Full Spectrum Warrior: Ten Hammers for Xbox and concludes with overall rating of 8.8 out of possible 10 that this game puts the whole ‘order your men around a battlefield to destroy everything in sight’ ideal on its rusty head and feeds it to the sharks with frikkin’ laser beams on their heads. It is much a revolution as an evolution of how games should be made to immerse the player and could even argue for a spot as the best of the Xbox 1, and we find it quite appalling that it doesn’t work as a backwards compatible game for the Xbox 360. BoomTown (dead link) gives overall rating of 7 out of 10 and says that the game doesn’t score ten out of ten but it does score quite above average. Full Spectrum Warrior: Ten Hammers is much more of the same as Full Spectrum Warrior with slight improvements and a bonus online mode. Those of you who experienced the original and didn’t like it, you won’t like this either. Those of you who enjoyed it will enjoy Ten Hammers and the extra vs. mode. A good sequel nonetheless, but not a great one.